For over 100 years the Akaushi breed has been subjected to intense genetic improvement. The red colored Wagyu are called Japanese Brown or Akaushi in Japan. Japanese Brown is the first name used by the Japanese in scientific literature. 80 plus years ago the Japanese Association of Akaushi was created in order to collect, manage and process all Akaushi data. The association has collected carcass performance, breeding pedigrees and economic data for every animal in the entire breed. This data has been used in the selection of every Akaushi dam and sire over the last half-century. During the same period this data has also been used to select prospective sire and dam lines to be utilized for further genetic improvement. Consequently, new sire and dam lines are only released for general production after they have been proven by extensive and accurate statistical analysis. As a result of this unique closed system and multi-trait selection process, the Akaushi breed is extremely uniform and consistent throughout its genetic line for all maternal, structural, fertility, carcass and palatability traits. No single trait has been sacrificed to develop this incredible breed. Therefore, Akaushi genetics may be the final ingredient to create an animal that will perform efficiently, improve consistency, maintain uniformity and maximize the gap between profit and loss. Akaushi cattle graze around the sacred volcano of Mt Aso and are the only Wagyu cattle that were selected over time to excel at growing and marbling on grass (extensive conditions). 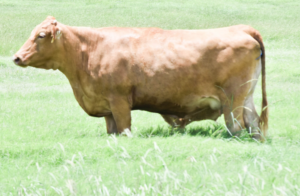 The Akaushi will improve and significantly raise the quality of the carcass while bringing hybrid vigor resulting in a heavier calf at weaning but maintain the renowned lower birth weights of Wagyu. Realising the value of their unique product, The Japanese Government banned the export of any Wagyu cattle and declared them a national treasure, in fact for many years only the Emperor, his family and the Samurai could eat Wagyu beef. There are many stories about these imperial cattle being massaged and fed on beer. This is not just folklore. The Japanese have devoted extraordinary care and attention to the rearing of this unusual breed of cattle. 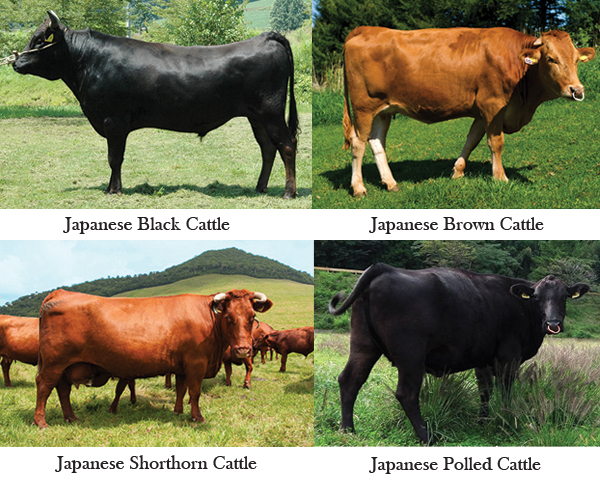 Akaushi cattle from Kumamoto district produce a carcass quality and consistency superior to most other breeds. The marbling contains a higher percentage of monounsaturated fat than most other beef breeds and is recognized for its health benefits. Some of the most important factors that affect the degree of adaptability of animals in tropical areas are the types of hide and coat colour. 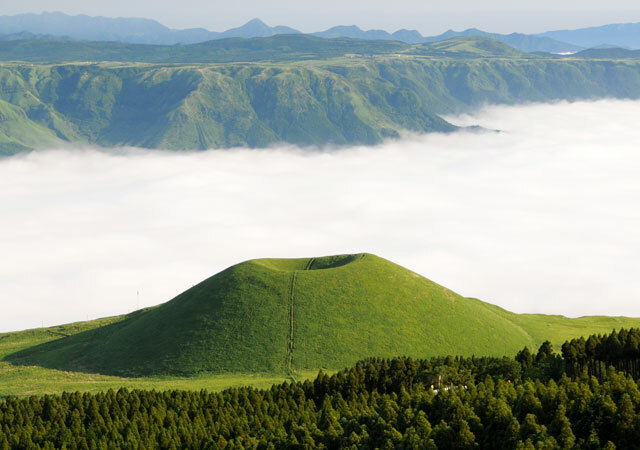 During their first stage of development, Akaushi’s were exposed to tick born diseases, external parasites and other natural endemic factors present in the hot and humid conditions of Kumamoto region in Japan. They developed smooth coats and thick loose skins. Coat colour is directly related to the animal’s capability to reflect infrared and ultraviolet radiation. Great emphasis was placed on selecting cattle with desirable colour and coat type without losing any of their amazing ability to marble for these tropical areas. 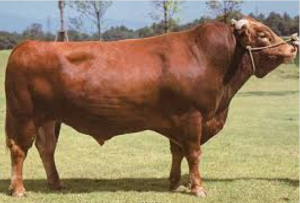 In these regions with large savanna areas which experience high humidity and temperatures with intensive infrared radiation, red, yellow and cream/white cattle with pigmented hides should be bred for maximum adaptability to overcome climatic conditions. 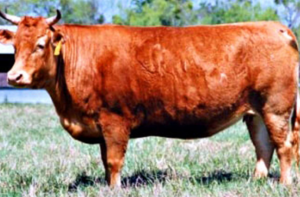 These animals were strongly influenced by Simmental and South Devon breeds and closely resemble modern beef cattle. 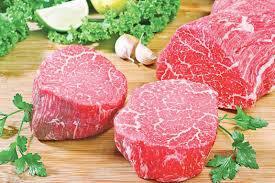 The carcass has traits of high marbling, very palatable and extremely consistent carcasses with minimal external fat. 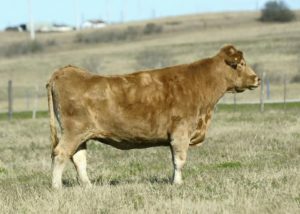 Infusion of these genetics in a cross breeding program will produce quality marbled meat resulting in substantially higher ret urns to producers, when compared with other beef breeds in the increasingly competitive local and overseas markets. With Brahman and Zebu type cattle found in many areas of South Africa, Akaushi is positioned to change beef production in South Africa. The ideal breed for upgrading meat quality substantially, increasing your profit margins and even adapting well to local tropical conditions in some areas of our country. 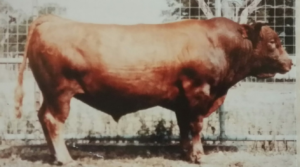 Two Akaushi bulls that were imported to USA in 1976, two heifers brought in by Japanese Venture Partners, and the batch of 12 males and females that arrived in 1994 are the sum total of 16 Akaushi live exports that left Japan. The first Red Wagyu/Akaushi were registered under the name Englewood in USA. 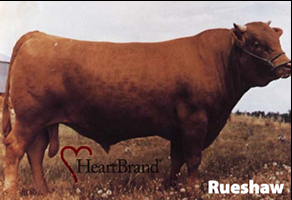 After breeding up from the original two bulls in 1976, the first purebreds were registered with the 1992 calf crop. 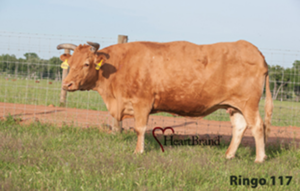 From the 1995 crop the Red Wagyu purebreds were registered under the Heart Brand name. In 1994 the ten live Akaushi imports arrived from Japan and they formed the base of the full bloods. Namiko, Ume, Namoi, Akiko, Haruko, Fuyuko, Dai 3 Namiaki, Dai 9 Koubai 73 and Dai 8 Marunami and the bulls Shigemaru, Tamamaru and Hikari all now are registered in the AWA and the Akaushi Association of America. These heifers were artificially inseminated to the best sires available in Japan at that time – Namimaru and Dai 10 Mitsumaru. Three were pregnant on arrival in USA and were the first Akaushi’s born outside of Japan. Calves born to AI from Namimaru and Dai 10 Mitsumaru were Big Al, Kaedemaru, Momigimaru, Ringo, 504 and 505. After the 180 days’ incubation that was required for quarantine, Namoi, Dai 3 Namiaki, Kaedemaru and Momigimaru went to Ontario in Canada. The remainder of the Red Wagyu/Akaushi herd in USA was sold to Englewood Farm in Texas. Subsequently all were purchased and transferred to the Heart Brand herd. 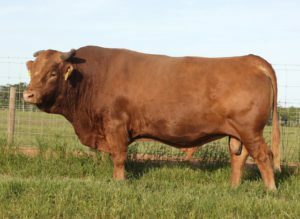 Japanese Venture Partners imported two Akaushi heifers Kunisakae and 27 Homare. 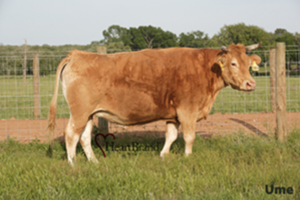 These heifers were in calf and subsequently sold to Bruce Hemmingsen in Texas. 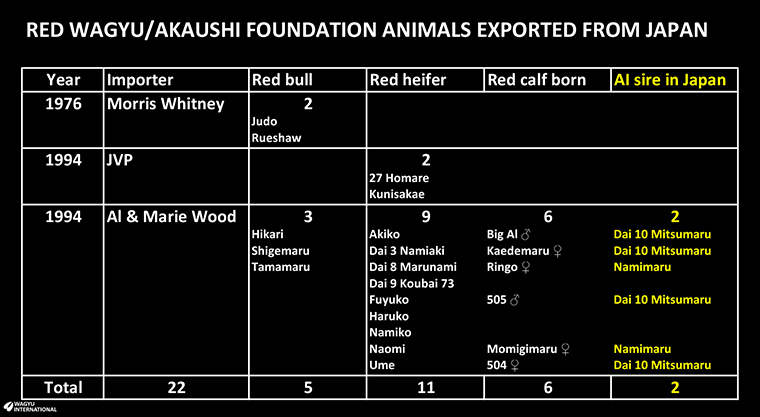 This table shows the foundation Red Wagyu/Akaushi cattle that were imported from Japan, and calves that were born from the artificial insemination program in Japan. With 9 years of dedicated research and various oversea visits we very proud to say that the Beyond Beef herd now includes all the original exported genetics from Japan between 1976 and 1994. Here are some great pictures of those original foundation animals that were exported to the USA. 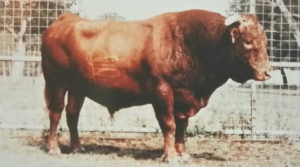 Dai-Ju 10 Mitsumaru Ko 76 – the Japanese champion bull that was selected at that time to artifically inseminate some of the original heifers like Akiko, exported in 1994. Some of these heifers gave birth in the USA after arrival to great animals like Big Al, the first ever Akaushi born outside of Japan. He is also the sire of Kaudemaru from the original imported Dai 3 Namiaki, 505 from the original imported Fuyuko and 504 from the original imported Ume. Big Al picture taken at Heartbrand in the USA, born from Akiko out of Dai 10 Mitsumaru, unfortunately he is deceased. Hikari, Tamamaru and Shigemaru from the second and last import of Akaushi catlle done by Dr. Al Wood in 1994. The Akiko and Fuyuko lines have as much name recognition as any in modern day Akaushi cattle. Akiko was said to be one of the stoutest Akaushi females alive. Her Shigemaru daughters are maternal legends due to their proven cow power. Fuyuko was one of the best looking, well-built females in her day. Her Big Al daughters have left their mark on Akaushi history. Both cows lived to be 20+ years of age. This is a currenet picture taken of her. Kaedemaru has one of the most interesting stories you’ll ever hear. 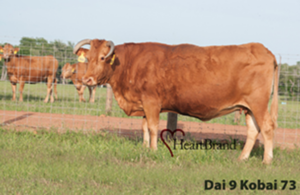 She was the live calf of Dai 3 Namiaki Ni, who was imported from Japan, and sired by Dai 10 Mitsumaru. She is the only living animal from the group of Akaushi that went to Canada in the 90’s. 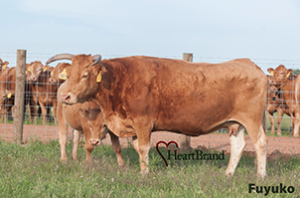 Kaedemaru was purchased by Bill Fisher and brought to TX because of her outstanding phenotype and rare pedigree. Dai 10 Eihou and Dai 3 Namiaki are what represents her maternal outcross lineages. Kaedemaru is still alive to this day at the age of 23 years !!! Ume and Haruko are two females that can’t be found in many pedigrees but are very prominent in quality. They represent such a small percentage of the Akaushi cattle in the western hemisphere but when you find one of their offspring you can count on a few things: 1- they will have many years of production in their tenure, 2- they will be top of the herd in terms of offspring quality and 3- you can’t take your eyes off of them! It doesn’t get any harder to find than these three! Ringo 117 is the natural calf of the famous cow Dai 8 Marunami and was born in Japan in 1994. Finding daughters and granddaughters of these gems didn’t happen overnight! 504E is the one referred to as the “Elephant Cow”. She is the natural calf of Ume out of Dai 10 Mitsimatu born in 1995. She got her name due to her impressive body mass and large feet. 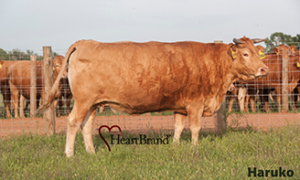 Dai 9 Kobai 73 is the great dam of Buckcherry S2421R probably the best cow in the Heartbrand herd currently. This is a daughter from Ringo 117, a rare genetic materpiece. She was the natural calf of Dai 8 Marunami born in Japan in 1994. This daughter is 13 years old with a calf at foot.